Hey, don’t forget to enter my giveaway for FREE PASTA! You can see the deets here. The contest is open until Wednesday. When I wrote up that pasta post, I forgot to mention that I had just finished a knock-down, drag-out battle with either the flu or the norovirus. Either way, it was horrendous. I hope none of you have had these bugs, because holy nausea, I haven’t been that sick in years. I honestly could not even stand up for 2 days, and I was incapacitated for about 5. It was so terrible, and I’m thankful it’s over now. Before the onset of the plague, I did another little experiment with the Sally Hansen gel nail kit, and (cue ominous music) this was the first negative experience I had with it. Let me preface by saying that this issue had nothing to do with the Sally Hansen kit. I was trying out another brand of color. I mentioned before that I tried the Sephora brand gel color and it worked great. This time, I tried the SensatioNail color. And it didn’t work so well. The first problem was that several of the nails got wrinkly. Are you familiar with this phenomenon? Once they cure, the polish actually kind of wrinkles up. I tried to get a photo of it, but it’s really difficult to see it in a still picture. This happened on 2 of my nails. At first, I wasn’t sure if it was the color, because at the salon I’ve had that happen and the manicurist told me it was because the base and top coats were “old.” So I thought maybe the Sally bottles had run their course. But after I took this polish off and did another mani with the Sally Hansen color and the old base and top coats, I had no trouble. So I think it’s the SensatioNail color that’s the problem. To be fair, I’m not sure the chip was the fault of the color; I could’ve had a splitting nail there that caused the issue. But the wrinkling was definitely a color problem. So, there’s your update. 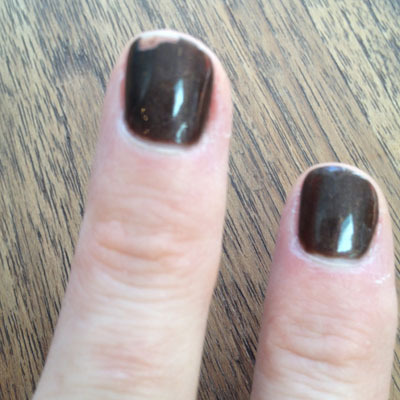 SensatioNail does not work very well. No problem! They didn’t really have any outstanding colors, anyway. I’m willing to try it again to see what happens, but in the meantime, I’ll use the Sally and Sephora colors.